Printed works from various artists will be on display at DePaul Art Museum this winter. Three exhibitions will include works by lithographers Clinton Adams and June Wayne of the Tamarind Institute, as well as by Chicago artists Barbara Jones-Hogu and Jose Guerrero, from the city’s South Side and Pilsen neighborhood, respectively. The exhibitions open Jan. 11 and run through March 25, 2018, at the museum on DePaul University’s Lincoln Park Campus. “Throughout the 20th century, printmaking has been embraced for its ability to reproduce images, but it has also been seen as less valuable than painting or sculpture in the art market for the same reason,” said Julie Rodrigues Widholm, director and chief curator of the museum. “DePaul Art Museum is interested in bringing under-recognized or overlooked artists and art forms into the program, and we wanted to explore the vitality of printmaking then and now in these exhibitions,” Widholm said. Clinton Adams and June Wayne are widely credited with reviving interest in lithography in the mid-20th century. As co-founders of the Tamarind Institute, a center for lithography based in Albuquerque, New Mexico, they instructed artists and shared innovative techniques while simultaneously pursuing their own independent practices. This exhibition presents a selection of both artists’ work from the 1950s through the 1990s, showcasing how their approaches to subjects, ranging from landscapes and color to literature and politics, evolved over time. “Rock, Paper, Image” will feature over 30 lithographs, an art form made by drawing a design on a stone or metal surface using a waxy, oily substance that repels water but absorbs ink, allowing the image to be transferred to paper, said Mia Lopez, the museum’s assistant curator. However, due to the complex process and the high price of stones required for printing, lithographs had declined in popularity before Adams and Wayne began the Tamarind Institute, she noted. Adams is best known for his work in modernist abstraction, with an emphasis on the Southwestern landscape. Wayne’s work shows an interest in science, natural phenomena, the cosmos, genes and social justice. She was feminist and a strong advocate for women artists, said Lopez. 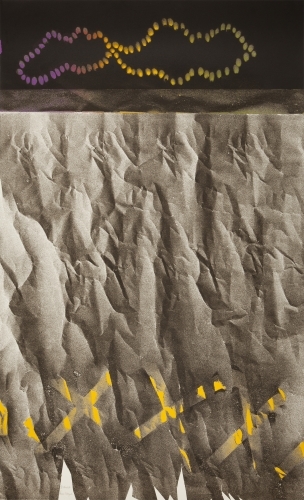 Another highpoint is Adams’ “Canyon,” which is an abstract color lithograph that uses orange, green and yellow and is reflective of the topography of the Southwest. “’Canyon’ is a strong example of how Adams combined his interests in the landscapes of the Southwest with abstraction, and also demonstrates his skillful ability to render texture through color lithography,” said Lopez. One of the galleries in the exhibition will explore Chicago print studios, highlighting different types of printmaking that occurs in the city today. Represented studios and collectives will include Spudnik Press, Instituto Grafico de Chicago and Hoofprint Workshop. A portion of the exhibition is from the museum’s collection, while the rest is on loan from the personal collection of Belverd Needles Jr. and Marian Powers. Needles and Powers have recently made a gift of 15 prints to the DePaul Art Museum collection, including works by Adams and Wayne. Needles, a professor of accountancy in DePaul’s Driehaus College of Business, is an internationally recognized expert in international financial reporting and auditing. Powers is an adjunct professor of executive education in Northwestern University’s Kellogg School of Management. DPAM director Julie Rodrigues Widholm and assistant curator Mia Lopez curated the exhibition. The first solo museum exhibition by Barbara Jones-Hogu, who died Nov. 14, 2017, features works on paper including woodcuts, etchings, lithographs and screen prints. Jones-Hogu, a founding member of the African Commune of Bad Relevant Artists (AfriCOBRA) and a central figure of the Black Arts Movement, was a Chicago-based artist, filmmaker and educator. She was a contributor to Chicago’s “Wall of Respect” mural, which celebrated its 50th anniversary in 2017. With AfriCOBRA, Jones-Hogu shaped the aesthetic philosophy of the organization and was instrumental in developing the group’s signature use of text in their works, according to Lopez. Jones-Hogu was committed to promoting positive images that could inspire and uplift the Black community, using her art to advocate for racial equality and empowerment, said Lopez. The exhibition boasts over 20 pieces and includes Jones-Hogu’s print work from 1968-75 as well as screen prints and sketches, ranging from black-and-white images to colorful works. “Her print work from the late 1960s and early 1970s is incredibly colorful and graphic but is also infused with political commentary about racism and positive messages about African-American communities and creativity,” said Widholm. 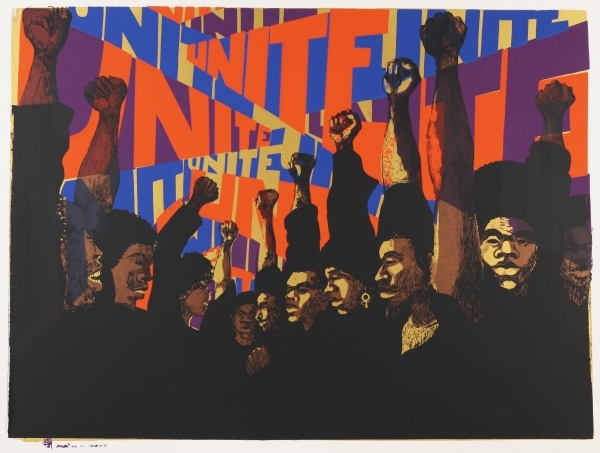 One of Jones-Hogu’s most famous works of art is a screen print on paper titled “Unite.” The work was made in 1971 and features several African-American persons holding their clinched fists in the air with the word unite written out repeatedly. “’Unite’ illustrates the impact that current events and the black power movement had on the artist and her work,” said Lopez. “Barbara Jones-Hogu: Resist, Relate, Unite 1968-1975” is part of Art Design Chicago, an exploration of Chicago’s art and design legacy, an initiative of the Terra Foundation for American Art with presenting partner The Richard H. Driehaus Foundation. The “Barbara Jones-Hogu: Resist, Relate, Unite 1968-1975” catalog is funded by the Terra Foundation for American Art and The Richard H. Driehaus Foundation. DPAM director Julie Rodrigues Widholm and assistant curator Mia Lopez curated the exhibition. Jose Guerrero, who died in 2015, was an artist and leader who influenced his community through printmaking, mural painting and activism. He is best known for his work in Chicago’s Pilsen neighborhood, where his studio and workshop was a hub for art classes, mural tours and political organizing. The exhibition “Jose Guerrero, Presente” features a portfolio of prints made in his memory by 25 Chicago artists, as well as some of his own works on paper. Artists include: Monserrat Alsina, Rene Arceo, Cathy Cajandig, Viky Cervantes, Héctor Duarte, Nicolas De Jesus, Roberto Ferreyra, Eric Garcia, José L Gutierrez, Salvador Jimenes, Alexy Lanza, Edgar Lopez, Alfredo Martinez, Dolores Mercado, Luis Montenegro, José L Pina Morales, Oscar Moya, Art Olson, Antonio Pazaran, Kate Perryman, Eufemio Pulido, Erik Salgado, Diana Solis, Benjamin Varela, Gabriel Villa and John Pitman Weber. A native of San Antonio, Texas, Guerrero moved to Chicago in 1964. He was a popular artist who infused activism and political organizing into community art making by opening his own print studio and leading mural tours in the Pilsen neighborhood, teaching people about the symbols and meaning behind cultural imagery, explained Lopez. Included in the 26-piece portfolio by Guerrero’s students, colleagues and friends are screen prints, woodcuts and linocuts. Themes that were central to Guerrero’s artistic practice and life’s work, including labor rights, displacement and gentrification, immigrant’s rights and social equality, are expressed in the collection. 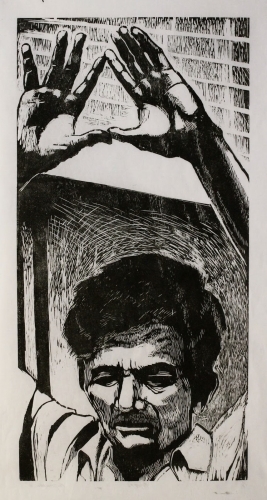 An iconic image in the exhibition is a linocut titled “Migrant” by Weber, founder of the Chicago Public Art Group. “Migrant” illustrates a man raising his arms over his head in a moment of strife. Weber and Duarte organized the Guerrero memorial portfolio a few years ago. Muralist Brother Mark Elder, C.M., an adjunct faculty member in DePaul’s art, media and design program, facilitated the donation and exhibition of the work. Assistant curator Mia Lopez organized the exhibition at DPAM. DePaul Art Museum is located at 935 W. Fullerton Ave. Hours are 11 a.m. to 7 p.m. Wednesday and Thursday; 11 a.m. to 5 p.m. Friday, Saturday and Sunday. The museum is closed Monday and Tuesday. Admission is free. Additional information at http://museums.depaul.edu​ or 773-325-7506.